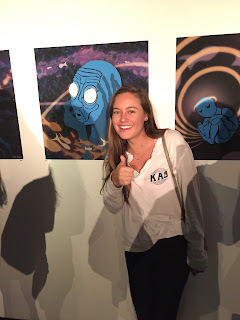 I visited the exhibition on May 19th held by a group of UCLA Art Science Undergraduate Society students. The exhibition demonstrated different examples of Nonlinear Perspectives and explored “nonlinear instability” from the varying views of the students within the Art Science Undergraduate Society at UCLA. The exhibit reminded me of Unit 2: Math and Art and the topic of perspective. The “Two Forms” piece talks about having multiple forms to interpret within its structure. It uses lightning as an example of entropy, which means “a gradual decline in disorder”. The lightning exemplifies this through its power and danger expressed through the art illustrations of flashes of light and thunder. Another form used to express entropy was “Waiting for Godot”. This is a play consisting of two men having spur-of-the-moment conversations and actions. This is considered narrative entropy. The artist points out that while this is only a story in a book and may seem harmless compared to lightning, the spontaneous conversation of two men may appear as an example of entropy when considered in a calm environment. It elicits the idea of “chaos in human context”. These next images illustrate different perspectives of plasma and flux ropes juxtaposed with a human character’s reaction to the concept of entropy within the images. This last video shows yet another perspective of entropy presented in the exhibit.